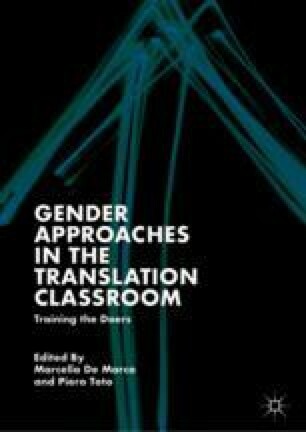 This chapter aims to present the importance of specialization and acquisition of gender competence for the practice of interpretation in contexts of gender-based violence. The arguments are of a political and technical nature, such as compliance with legislation or improvement of the efficiency and quality of the services available. However, there are also ethical considerations. Gender training equips interpreters with an interpretative framework from which to focus on violence as a structural and systematic phenomenon. This conceptualization removes any normalization or justification of violence. It also enables interpreters to develop critical awareness of their own actions that help them identify or recognize cultural prejudices and stereotypes that are internalized and rooted in society and that hinder the scrupulous technical neutrality and ethical commitment required. Amnesty International. 2007. Más riesgos y menos protección. Mujeres inmigrantes en España frente a la violencia de género. Retrieved from https://www.es.amnesty.org/uploads/media/Informe_Mas_riesgos_y_menos_proteccion_231107.pdf. Arnoso, M., A. Arnoso, M. Mazkiaran, and A. Irazu. 2012. Mujer inmigrante y violencia de género: factores de vulnerabilidad y protección. Migraciones 32: 169–200. Retrieved from https://revistas.upcomillas.es/index.php/revistamigraciones/article/viewFile/912/772. Bischoff, A. 2003. Caring for Migrant and Minority Patients in European Hospitals. A Review of Effective Interventions. Neuchâtel: Swiss Forum for Migration and Population Studies. http://www.mfh-eu.net/public/files/mfh_literature_review.pdf. Blasco, M.J., and M. Del Pozo Triviño (eds.). 2015. Legal Interpreting at a Turning Point/La interpretación en el ámbito judicial en un momento de cambio. MonTI 7. Retrieved from http://rua.ua.es/dspace/handle/10045/52536. Bowen, S. 2010. From ‘Multicultural Health’ to ‘Knowledge Translation’. Rethinking Strategies to Promote Language Access Within a Risk Management Framework. Jostrans 14: 145–164. Retrieved from http://www.jostrans.org/issue14/art_bowen.pdf. Del Pozo Triviño, M., A. Vaamonde, D. Casado-Neira, S. Pérez Freire, A. Vaamonde, M.D. Fernandes, and R. Guinarte. 2014a. Comunicación entre profesionales de la atención en violencia de género y víctimas/supervivientes que no hablan el idioma. Informe sobre la encuesta a agents del proyecto Speak Out for Support (SOS-VICS)/Communication Between Professionals Providing Attention and Gender Violence Victims/Survivors Who Do Not Speak the Language. A Report on the Survey Carried Out on Agents During the Speak Out for Support (SOS-VICS) Project. Servicio de Publicaciones de la Universidad de Vigo. Retrieved from http://sosvicsweb.webs.uvigo.es/blogs/files/report-on-the-survey-carried-out-on-agents-during-the-speak-out-for-support-sos-vics-project.pdf. ———. 2014b. Formación especializada en interpretación para víctimas/supervivientes de violencia de género. Informe sobre la encuesta DELPHI a intérpretes del proyecto Speak Out for Support (SOS-VICS)/Specialised Training for Interpreters Working with Gender Violence Victims/Survivors. A Report on the Delphi Survey Carried Out on Interpreters During the Speak Out for Support (SOS-VICS) Project. Servicio de Publicaciones de la Universidad de Vigo. Retrieved from http://sosvicsweb.webs.uvigo.es/blogs/files/report-on-the-delphi-survey-carried-out-on-interpreters.pdf. EU. Directive 2010/64/EU of the European Parliament and of the Council on the Right to Interpretation and Translation in Criminal Proceedings. Retrieved from http://eurlex.europa.eu/LexUriServ/LexUriServ.do?uri=OJ:L:2010:280:0001:0007:en:PDF. EU. Directive 2012/29/EU of the European Parliament and of the Council of 25 October 2012 Establishing Minimum Standards on the Rights, Support and Protection of Victims of Crime, and Replacing Council Framework Decision 2001/220/JHA. Retrieved from http://eur-lex.europa.eu/LexUriServ/LexUriServ.do?uri=OJ:L:2012:315:0057:0073:EN:PDF. FRA [European Union Agency for Fundamental Rights]. 2014. Violence Against Women: An EU-Wide Survey: MAIN Results Report. Retrieved from http://fra.europa.eu/sites/default/files/fra-2014-vaw-survey-main-results-apr14_en.pdf. Lemon, N.K. 2006. Access to Justice: Can Domestic Violence Courts Better Address the Need of Non-English Speaking Victims of Domestic Violence. Berkeley Journal of Gender, Law & Justice 21 (1): 38–58. Retrieved from http://scholarship.law.berkeley.edu/bglj/vol21/iss1/3. Romero, I. 2010. Intervención en Violencia de Género: Consideraciones en torno al Tratamiento. Intervención Psicosocial 19 (2): 191–199. Retrieved from http://scielo.isciii.es/pdf/inter/v19n2/v19n2a10.pdf. Toledano Buendía, C., and M. Del Pozo Triviño (eds.). 2015. Interpretación en contextos de violencia de género. Valencia: Tirant Lo Blanch. Retrieved from http://cuautla.uvigo.es/sos-vics/blogs/files/manual-para-interpretes-sosvics.pdf. United Nations. 1993. Declaration on the Elimination of Violence Against Women. Retrieved from http://www.un.org/documents/ga/res/48/a48r104.htm. ———. 1996. Report of the Fourth World Conference on Women Beijing, 4–15 September 1995. Retrieved from http://www.un.org/womenwatch/daw/beijing/pdf/Beijing%20full%20report%20E.pdf. United Nations Women. 1979. The Convention on the Elimination of All Forms of Discrimination against Women (CEDAW). Retrieved from http://www.un.org/womenwatch/daw/cedaw/. Yoshihama, M., M. Runner, and S. Novick (eds.). 2009. Intimate Partner Violence in Immigrant and Refugee Communities: Challenges, Promising Practices and Recommendations. Robert Wood Johnson Foundation. Retrieved from https://www.futureswithoutviolence.org/userfiles/file/ImmigrantWomen/IPV_Report_March_2009.pdf.